This week’s Wine Economist looks back at the five columns first published in 2018 that captured the most interest among the wine industry audience that frequents this page. Sometimes it is difficult to find a common thread among the top columns, but not this year. Readers were concerned about U.S. wine sales and they focused on analysis that they hoped might give them insights into the changing market place and especially how to deal with the changing wine consumer base. Take a look at the Top 5 and see if you agree. Concerns about wine sales were obviously on readers’ minds when this September 2018 column appeared. The premise of the piece was simple: we are all pretty familiar with the conventional wisdom about the wine market but the conventional wisdom doesn’t always hold in a changing world. Sometimes you need to look more closely at the data (Nielsen data in this case) to see what’s actually going on. There were plenty of surprises to be found (five of them, as the title indicates), including Zinfandel’s high average price (higher than Pinot or Cab), Cabernet’s move past Chardonnay in total sales, the resurgence of French wine (think pink), Australia’s real sales challenge (price, not quantity), and Washington wine’s unexpected prominence when you shift the frame of reference a bit. The Silicon Valley Bank‘s annual wine industry report always gets a lot of attention and with good reason. Timely analysis + innovative thinking + clear presentation = required reading. But the complexity of the study is sometimes lost in the rush to report the headline conclusions. So I decided to take a deeper dive and shine a light on some of the aspects that weren’t getting the attention they deserved, especially with respect to the generational transition in the wine market. This also gave me an opportunity to make a point of my own: sometimes the differences within generational cohorts are as important as the difference between them. #3 Shaw Organic: Is This the Next Miracle from Bronco Wine & Trader Joe’s? Organic food has moved from a niche to an important market segment. A lot of us have been waiting for wine to catch up. Bronco Wine, the makers of Charles Shaw (a.k.a. Two Buck Chuck), apparently got tired of waiting and, working with Trader Joe’s stores, introduced Shaw Organic, a line of affordable wines made with organic grapes. Bronco is the largest vineyard owner in the U.S. (40,000 acres at last count) and has quietly become the largest grower of organic grapes as well. Is Shaw Organic the breakout wine — the wine that will create a critical mass of consumers who look for organic wine the same way that Two Buck Chuck democratized the wine market more generally? Too soon to tell, but it is a trend to watch. Direct-to-consumer wine sales are on everyone’s mind. With costs rising faster than prices in most cases, those full-margin wine club sales have become a very high priority. Some say that many Napa Valley producers couldn’t keep the lights on without their wine club sales. So who has the largest wine club? Incredibly, it is an Illinois-based restaurant and winery business called Cooper’s Hawk, which counts about 300,000 wine club members who visit their local restaurants once a month to pick up the latest wine. What makes Cooper’s Hawk so successful (and how can wineries reach the market they’ve developed)? And can the lessons of Cooper’s Hawk be applied more generally? Timely questions. No wonder this is the #2 column of the year. #1 Outlaw Wine: 19 Crimes Succeeds by Breaking All the Wine Marketing Rules. Millennials. They are the wine market of the future and the future is now. But what do they want and how do you get their attention? This May 2018 column, which is top of the list, looks at an incredibly successful Treasury Wine Estates product that was specifically developed to appeal to millennial men. It is called 19 Crimes, which is kind of a strange name for a wine, and while I am not a big fan of the wine itself (it wasn’t crafted to appeal to me), I am very impressed with the way it has succeeded beyond all reasonable expectations by breaking all the wine marketing rules. This is the final Wine Economist column of 2018. See you next year! Two Buck Chuck (a.k.a. Charles Shaw wine) celebrated its fifth birthday recently, so this is a good excuse to for a new initial thoughts about what the success of this bargain wine says about the wine market today. Charles Shaw is the brand of very inexpensive wines that Fred Franzia’s Bronco Wine company makes for exclusive distribution through the Trader Joe’s chain. 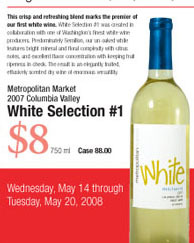 The wines sell for $1.99 in California ($2.99 here in Washington state), which accounts for the “two buck” nickname. Total sales over five years: 300 million bottles. Two Buck Chuck (TBC) is made possible by the current worldwide glut of wine — something that I will write more about later. There is a lot more wine made today than people will buy and so bulk prices have fallen, creating a profitable opportunity for someone, like Fred Franzia and the Trader Joe’s people, who know how to distribute and market it efficiently. Franzia is part of this glut of course, with perhaps 40,000 acres of vines. TBC aimed to find a big demand for a big supply, and it did it. Some of my friends buy TBC and they are always amazed by the relative value: it may not be great wine, but it’s lot better than a $2 or $3 wine, they say. I think that’s true, but I wonder how they know — have they drunk a lot of $3 wine? I doubt it! Most supermarket wine buyers judge a wine by its price, or at least that is what the research says. They don’t know for sure what is in the bottle and so they are guided by price more than any other factor. I know some $8 wine buyers, for example, who probably wouldn’t buy a $5 wine under normal circumstances, because they assume that it is lower quality. And they probably wouldn’t buy a $12 wine, either, assuming that it wouldn’t be worth the extra cost. So they stick to that $6-$8 wine shelf (you know where it’s at in the grocery store), not looking higher up and not looking much lower on the rack either. They know what they like, and it costs about eight bucks. So the trick isn’t making an inexpensive wine — that’s doable in this market environment — it’s getting people to buy it. Once you have made a decent wine that you can sell for less, the hard part is to get buyers to look down from their accustomed price points and try it — and to serve it to their friends without humiliation. If you put a TBC clone in Safeway, for example, it’s entirely possible that no one would buy it because they would assume low quality based upon the low price. That’s where Trade Joe’s comes in. Trader Joe’s has a reputation for selling upscale products for a bit less — for providing relative value. Only Nixon could go to China and only Trader Joe’s could sell Two Buck Chuck — for two bucks. In fact, if you look around, you will actually see a lot of TBC clones in your grocery store, but they sell for more than two bucks. I am talking about the generic “critter wines” (more about this in future posts). They are also a product of the global wine glut and they provide good relative value. But no one would buy them for $2 — how could they be any good? So they sell for a bit more. By the way, the Charles Shaw brand is actually a good deal older than the five year birthday suggests. The Charles Shaw winery was founded in the Napa Valley in 1974 by Charles F. Shaw for the purpose of making Beaujolais-style wines. Fred Franzia bought the brand from Shaw in 1991 in order to take advantage of its solid reputation. But that’s history — no one pulling a TBC cork today remembers that original Napa winery, they are only thinking about the bargain price.